Actor and Milwaukee Brewers radio announcer Bob Uecker will need to get himself a new boat as his yacht was damaged when it was hit by a 550-foot freighter on Tuesday. 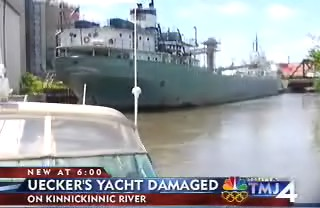 The freighter crashed into the yacht while it was docked near Milwaukee, causing thousands of dollars in damage, WISC-TV reported. Uecker was supposed to use the boat in his charity fishing tournament on Thursday and a local boat dealer has loaned him another boat for the event. There's no report yet on the speedo that Bob will wear for the charity event but I hoping for the leopard print. Also, 550 foot freighter?! How is that thing still floating? I'm picturing Rodney Dangerfield plowing into Judge Smails little wooden boat, but I know nothing about yachts (obviously), so I could be completely off base with the reenactment in my head. You can never be wrong with that reenactment. "Hey, you scratched my anchor!" Who was driving that thing--Christopher Hewitt? It's not a joke but the Bob Uecker charity fishing tournament makes me laugh. Dude, you've got to know that it's "Smails", not "Smalls".